Secretary of State Mike Pompeo speaks at the Heritage Foundation on May 21, 2018 in Washington, D.C.
(CNN) - Secretary of State Mike Pompeo has arrived in Afghanistan on an unannounced visit after arriving from his previous stop in Vietnam. He met with Afghan President Ashraf Ghani and was scheduled to meet with U.S. forces in Afghanistan before leaving the country. At a news conference alongside Ghani, Pompeo said he had come to Afghanistan to "learn of the progress made" since President Donald Trump announced his strategy for the region last August. 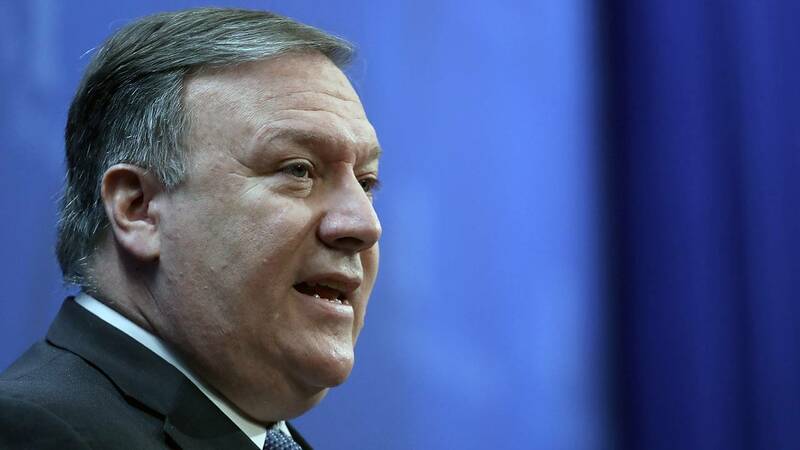 Pompeo said the strategy is "working" and has sent a message to the people of Afghanistan that the United States supports them and sent a "clear message" to the Taliban that the Taliban cannot wait out the departure of the United States. Pompeo stressed that peace must be made by Afghans. Pompeo was also asked about his stop in North Korea and the difference in tone between the United States and North Korean readouts of the meetings. Pompeo said the two sides "still have a long ways to go" in getting an agreement between the two sides but he said the commitment made by Kim Jong Un at last month's summit in Singapore with Trump "remains." Pompeo said the statements coming out of North Korea following the meetings were "mixed," and he said a statement attributed to Kim Jong Un after the meeting "continued to express a desire" for denuclearization of the Korean peninsula. "I'll give you one quick answer with respect to North Korea," Pompeo said. "We, we still have a long ways to go. But, the commitment that the North Koreans made, frankly that Chairman Kim personally made to President Trump remains, has been reinforced. I saw some of the statements came out, they were, they were mixed. You haven't reported on that, the mixed statements, but maybe, maybe you will now, that the statements that were put out, Chairman Kim's statement following our discussions continue to express his desire to complete the denuclearization to which he is so committed."